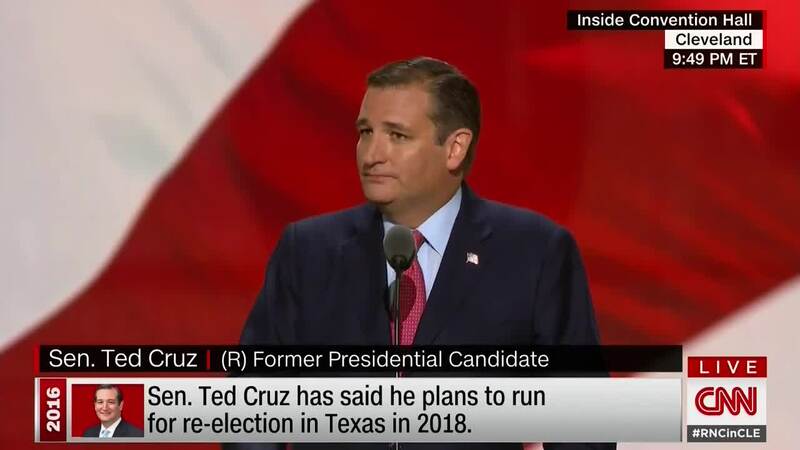 Ted Cruz became the first speaker at the GOP convention to receive almost universal condemnation from the Republicans, as he ended his speech Wednesday night without endorsing Donald Trump. The Texas senator, who battled Donald Trump more fiercely than any other Republican hopeful during the primary process, gave a passionate speech extolling conservative virtues and excoriating Hillary Clinton. But he made only one reference to Trump, when he congratulated him on winning the GOP nomination the night before. Conservative pundit Laura Ingraham, who spoke earlier in the evening, seemed to criticize Cruz for failing to fully back Trump, calling on "boys with wounded feelings and bruised egos" to pledge to support Trump now. According to a report on Twitter, Cruz's wife Heidi had to be escorted out by security after the crowd became enraged at her husband. "We deserve leaders who stand for principle. Unite us all behind shared values. Cast aside anger for love. That is the standard we should expect, from everybody," Cruz said toward the end of his speech, as members of the crowd began to chant at him. "Stand, and speak, and vote your conscience, vote for candidates up and down the ticket who you trust to defend our freedom and to be faithful to the Constitution," he said, without ever calling on voters in the room and watching at home to cast ballots for Trump. Ted Cruz: "Vote your conscience." You see the good and bad of Cruz in this speech. Guts to stand up to Trump at convention, but still so much sleazy rhetoric along the way. Nobody at #RNCinCLE has the stones of @tedcruz - dude faced down the crowd and told voters to vote their conscience- didn't endorse Trump. Does anyone really think Ted Cruz minds being booed?